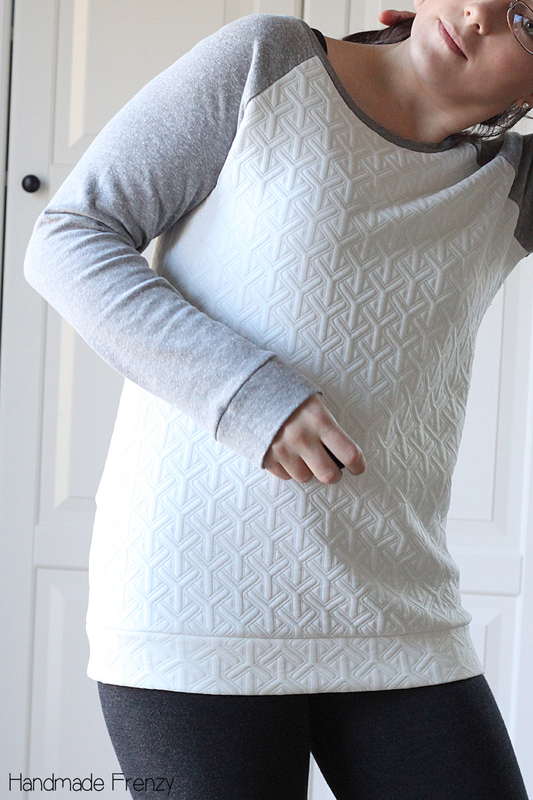 Today is all about COMFY. 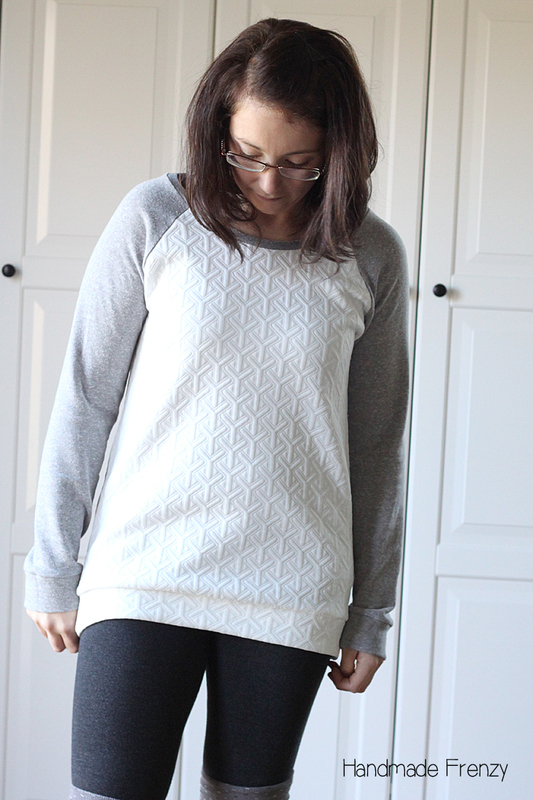 I spotted this embossed double knit and knew I had to have it for a raglan sweatshirt. 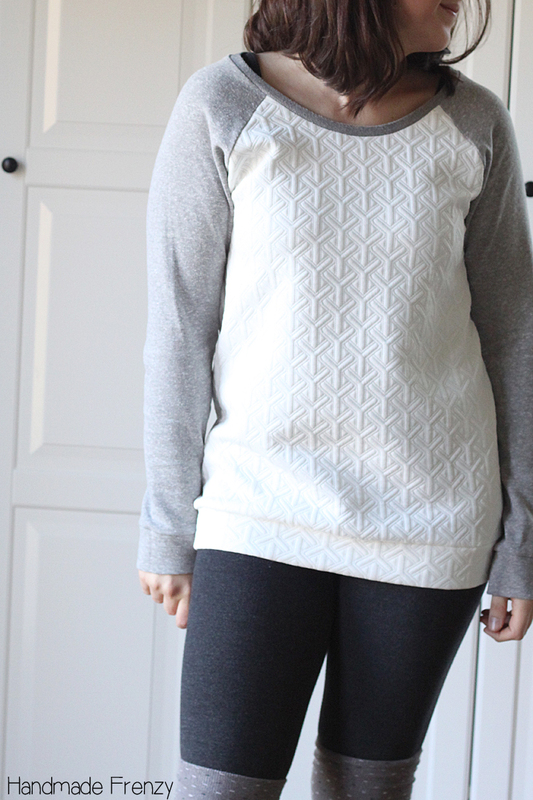 I paired it with gray french terry from Joann's. 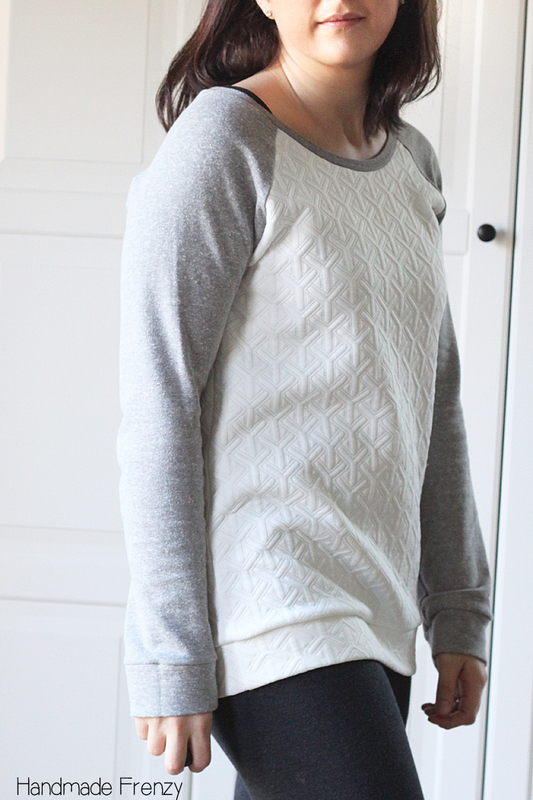 I used the wrong side of the french terry for the neckline as per the inspiration photo. I have learned through two french terry shirts (I'm posting the next one later this week!) that using it for the neckband means you will have a wider neckband than if using, say, a sturdy rib knit. The french terry has very little recovery and needs to be stretched to the max to pull things in and even then it's not going to give you a tight fit. At least this is my experience! I like the look for this sweatshirt, I think it lends itself nicely, but it is definitely something I will be taking into consideration in the future. 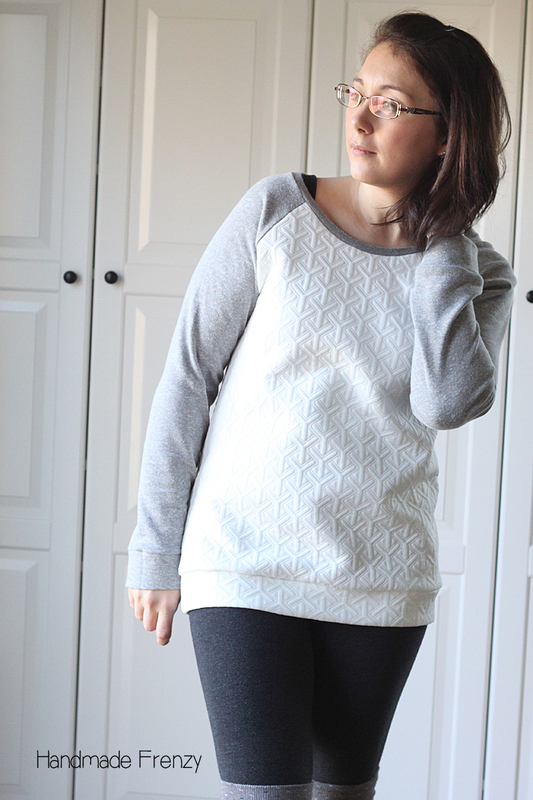 Overall, I totally love this new sweatshirt of mine! I've reached for it quite often since finishing it up and I know it will be getting lots of wear in the cold months around here. I'm not sure if I've mentioned it here on the blog or not yet, but I finally got a serger late last year. Yes!! It took until around Christmas time for me to get brave enough to use it regularly and since then I have been unstoppable on that thing. ;) That is probably a factor in my uber sewjo lately. 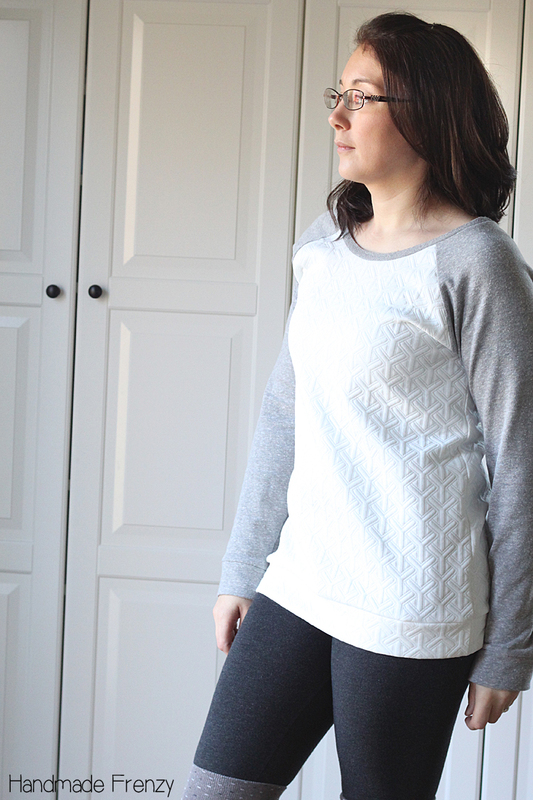 Have you made a Lane Raglan sweatshirt yet? I love your lane raglan. I have made a few and they are wonderful. The t-shirt she has is also a favorite of mine. I have had a serger for a couple of years and my neckline binding tip is to serge around the edge of your binding (without cutting any off) to hold the two sides together and then when you add it to the shirt serge in just a little closer so it's not exposing any of those stitches. I haven't had a slipped fabric neckline problems since I started doing this! :) Makes it easier to iron once it's all serged together before you add it to the shirt. Thank you! I love all of mine too! Her t-shirt is on the short list, once the weather warms up I'll probably be making several. At least. ;) That's a great tip about serging the neckband together! My problem this time was that because of the zero recovery, my neckband was too long so I had to take it all the way off, shorten and re-attach. Blah! Haha. 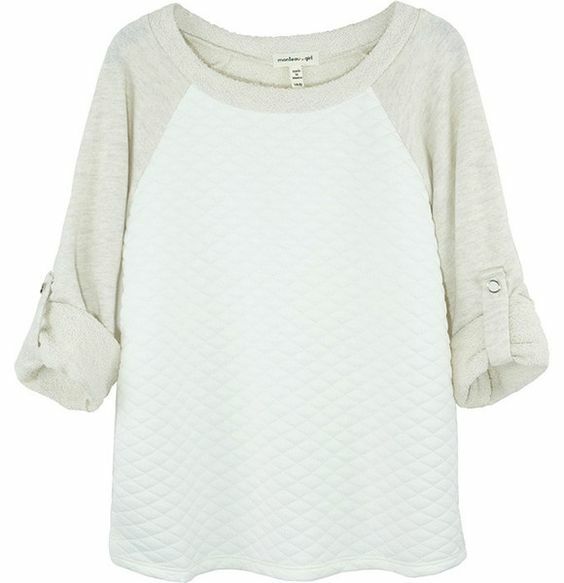 I just LOVE your sweatshirt, and I especially love the embossed ponte knit fabric you used, but alas, fabric.com no longer has this in stock in any color. I've begged them to please contact their buyers, and try to re-buy this product. I am in love with the cool geometric embossing. I'm still going to make my version, but I'd really like to make it with this extremely cool fabric you found! !